Even though there are many body parts that require extra protection on the road, the legs require special consideration if you ride a motorcycle. Today, we take a closer look at the options for leg protection, so be sure to read on if you want to be the safest you can be. 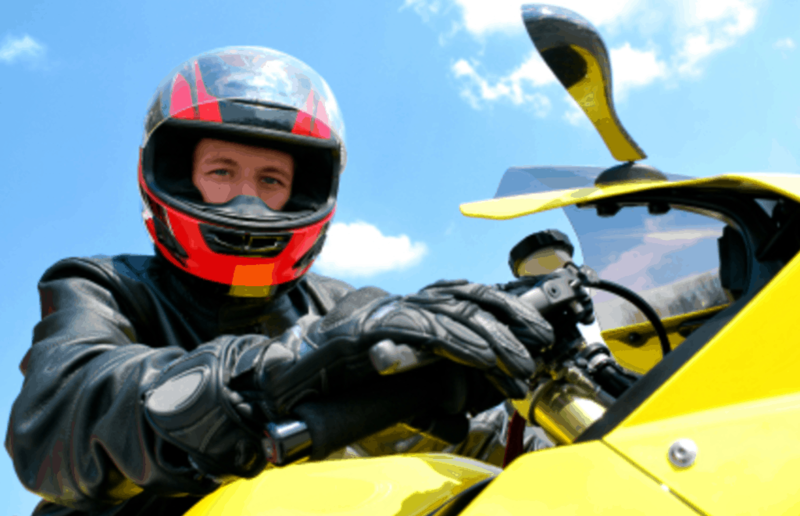 Many people who just get into motorcycles think that motorcycle attire is just the lifestyle, but it provides the protection you need to prevent injury in case of a collision or fall. When it comes to protecting your legs, you will need a pair of sturdy boots and durable pants. The boots must provide you with ample protection since they could be the difference between severe injury or light injury when your motorbike ends up on your leg. A durable pair of pants could protect your skin against abrasions, cuts, and scrapes, so make your decision carefully. What Are the Best Motorcycling Boots? Now we determined you will need good motorcycle boots, let us elaborate on what you need to look out for. 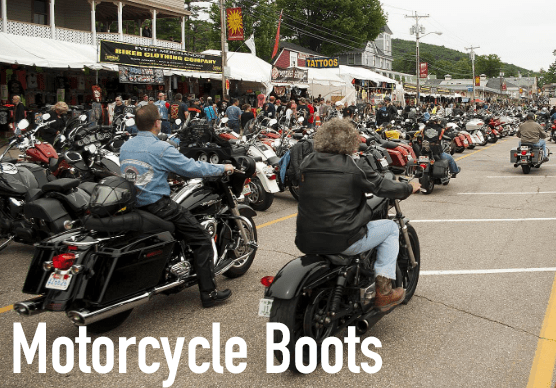 Motorcycle boots must be a blend of comfort and protection; this means you should be able to wear them all day long. Of course, there are more things to look out for, which we will describe below. Biking boots come in all shapes, sizes, and designs, but the height of your boots is more important than anything. The height of good motorcycle boots must at least come over the ankle. They must also provide sufficient support and be made from durable materials to deliver ample protection. One of the main injuries that could occur during a crash is caused by the foot being trapped underneath the bike. Therefore, if you have a good set of boots to protect you from the weight of the bike, you could prevent some serious injuries. Another type of injury that could be encountered is scraping or cutting of the foot and leg. Once again, sturdy boots made from a durable material could potentially prevent such an injury. So, when you are buying your boots, make sure you check its height! The material your boots are made of is important too. Materials such as canvas and soft leather do not provide the protection you need on your motorbike, since a fall could mean you encounter the asphalt. Instead, you will need biking boots made from more durable leather. Thick leather is usually the recommended material for biking boots; this because the leather has more resistance against abrasions. However, your choice is not limited to thick leather, since there are materials that combine the durability of thick leather with the breathability of other textile materials. When selecting the material for your boots, be sure to check the recommended “reinforced” areas on your boots. Some areas on the boots must be extra strong, so be sure to check for double material layers, plastic sliders, and textiles for additional protection. In addition to having ample protection during crashes and falls, bikers must also consider the weather. When you ride a bike, you are often exposed to poor weather conditions. For example, if you have your heart set on boots made from thick leather, make sure the leather is treated; this ensures the water gets repelled instead of absorbed when encountering rainy weather. Biking boot manufacturers can use a variety of closures for your biking boot; this includes laces, zips, buckles, and Velcro. When it comes to closures, you often have free reign. However, we must mention that the boots must provide a secure fit, so if you cannot obtain that from laced boots, you may want to look at Velcro instead. Some bikers are concerned about the additional injuries some metal materials used for buckles and zippers can cause during an accident. However, the strategic placement of these closures reduces the chance of this problem occurring. We must mention that most bikers prefer Velcro and buckles; this due to the fact these closures provide a better fit and prevent the boots from coming off during a high-speed collision or crash. While boot stitching might not be the first thing you think about, it is still important for the durability of your biking boots. Proper boots always have double and even triple-stitching, which provides more protection during a collision or crash. When checking the stitching used on your biking boots, also have a look at how the sole has been attached to the boot. If the sole is glued on, your biking boots will not provide as much protection as soles that have been stitched on the boot. Bikers who need to buy a new set of boots also need to look at the bottom of the boot, more specifically at the grip of the soles. Your ability to control your bike during a dangerous road situation could depend on it! There are various types of soles available, each with their own benefits. Many bikers go for softer soles, which allows them to get more grip on the foot peg. However, these types of soles tend to wear down quicker than harder equivalents. Contrary to that, if you purchase boots with a harder sole, you will have less grip, but a more durable boot. What Are the Best Motorcycling Pants? Motorcycle pants can come in various material, each with their advantages and disadvantages. Below, we have provided an overview with the most common types of biking pants materials, so you can make an informed decision in stores. Denim pants is not recommended for bikers, even though they are being sold in stores. They have virtually no abrasion resistance, which means injuries are more likely in case of a fall. Contrary to denim, aramid is a much better choice. The material is made from heat-resistant synthetic fibers as well as a liquid chemical blend. The result is a material that is more resistant to abrasions that could occur during a fall or a collision. Bikers should consider Kevlar first and foremost. You might recognize the name Kevlar since this material is used in the manufacturing of body armor. Kevlar is lightweight, but has incredible strength, abrasion resistance, and provides additional protection against heat. Kevlar is also five times stronger than steel, so it is no surprise that many bikers prefer Kevlar for their biking gear! Another material you could encounter in the biker store is ballistic nylon. The material is based on the synthetic fiber nylon but is reinforced to make applications for biker equipment possible. Ballistic nylon is commonly used as reinforcement material in biker gear. Much like Kevlar, ballistic nylon has great strength and abrasion resistance. Therefore, this material should also be a consideration for bikers. Most bikers are familiar with the materials mentioned above, but not everyone is familiar with Keprotec. Keprotec is a material manufactured by a company called Schoeller in Switzerland. The material provides lots of abrasion resistance but is also breathable. So, for bikers who feel uncomfortable in clothing made from the toughest leather, Keprotec gear might be better for them. Is Stitching Important for Motorcycle Pants? We already covered the topic of stitching in the boots section of this article, but it is worth mentioning again for pants. Once again, the material of your gear is important, but so is the stitching. You may have bought gear made from the strongest materials, but this does not mean you have maximum protection against abrasions! No, the stitching must be on point too, so always check the strength of the stitching used on your biker gear. It could mean the difference between a light and serious injury. What Are the Characteristics of Genuine Motorcycle Pants? Genuine motorcycle pants will meet certain requirements. Firstly, it will be made from heavy textile or thick leather, ensuring proper protection for the biker in case of a fall or collision. It will contain flexible hard armor in the knees and hips, stretch panels for comfort, reflective piping, and memory foam inserts to absorb potential impacts. So, if you are buying some new gear, be sure to look out for these essentials on biking pants too. What Are the Differences Between Touring, Daily, and Dedicated Motorcycle Pants? When you head to the store, you will notice that motorcycle pants are advertised by the purpose they are made for. However, for maximum protection, you will always need dedicated motorcycle pants. Even though touring and daily pants provide some degree of protection, they do not come close to the protection dedicated motorcycle pants can provide you. In conclusion, dedicated motorcycle pants are always best when it comes to your safety. Accidents can happen anywhere at any time, so even if you are an experienced biker, it does not mean you are not going to encounter an accident. Therefore, protection is key for your safety!